Tropical cyclogenesis is the development and strengthening of a tropical cyclone in the atmosphere. The mechanisms through which tropical cyclogenesis occurs are distinctly different from those through which temperate cyclogenesis occurs. Tropical cyclogenesis involves the development of a warm-core cyclone, due to significant convection in a favorable atmospheric environment. Tropical cyclogenesis requires six main factors: sufficiently warm sea surface temperatures (at least 26.5 °C (79.7 °F)), atmospheric instability, high humidity in the lower to middle levels of the troposphere, enough Coriolis force to develop a low-pressure center, a pre-existing low-level focus or disturbance, and low vertical wind shear. Tropical cyclones tend to develop during the summer, but have been noted in nearly every month in most basins. Climate cycles such as ENSO and the Madden–Julian oscillation modulate the timing and frequency of tropical cyclone development. There is a limit on tropical cyclone intensity which is strongly related to the water temperatures along its path. An average of 86 tropical cyclones of tropical storm intensity form annually worldwide. Of those, 47 reach hurricane/typhoon strength, and 20 become intense tropical cyclones (at least Category 3 intensity on the Saffir–Simpson Hurricane Scale). There are six main requirements for tropical cyclogenesis: sufficiently warm sea surface temperatures, atmospheric instability, high humidity in the lower to middle levels of the troposphere, enough Coriolis force to sustain a low pressure center, a preexisting low level focus or disturbance, and low vertical wind shear. While these conditions are necessary for tropical cyclone formation, they do not guarantee that a tropical cyclone will form. Waves in the trade winds in the Atlantic Ocean—areas of converging winds that move slowly along the same track as the prevailing wind—create instabilities in the atmosphere that may lead to the formation of hurricanes. Normally, an ocean temperature of 26.5 °C (79.7 °F) spanning through at least a 50-metre depth is considered the minimum to maintain a tropical cyclone. These warm waters are needed to maintain the warm core that fuels tropical systems. This value is well above 16.1 °C (60.9 °F), the global average surface temperature of the oceans. Tropical cyclones are known to form even when normal conditions are not met. For example, cooler air temperatures at a higher altitude (e.g., at the 500 hPa level, or 5.9 km) can lead to tropical cyclogenesis at lower water temperatures, as a certain lapse rate is required to force the atmosphere to be unstable enough for convection. In a moist atmosphere, this lapse rate is 6.5 °C/km, while in an atmosphere with less than 100% relative humidity, the required lapse rate is 9.8 °C/km. At the 500 hPa level, the air temperature averages −7 °C (18 °F) within the tropics, but air in the tropics is normally dry at this level, giving the air room to wet-bulb, or cool as it moistens, to a more favorable temperature that can then support convection. A wetbulb temperature at 500 hPa in a tropical atmosphere of −13.2 °C is required to initiate convection if the water temperature is 26.5 °C, and this temperature requirement increases or decreases proportionally by 1 °C in the sea surface temperature for each 1 °C change at 500 hpa. Under a cold cyclone, 500 hPa temperatures can fall as low as −30 °C, which can initiate convection even in the driest atmospheres. This also explains why moisture in the mid-levels of the troposphere, roughly at the 500 hPa level, is normally a requirement for development. However, when dry air is found at the same height, temperatures at 500 hPa need to be even colder as dry atmospheres require a greater lapse rate for instability than moist atmospheres. At heights near the tropopause, the 30-year average temperature (as measured in the period encompassing 1961 through 1990) was −77 °C (−105 °F). A recent example of a tropical cyclone that maintained itself over cooler waters was Epsilon of the 2005 Atlantic hurricane season. Kerry Emanuel created a mathematical model around 1988 to compute the upper limit of tropical cyclone intensity based on sea surface temperature and atmospheric profiles from the latest global model runs. Emanuel's model is called the maximum potential intensity, or MPI. 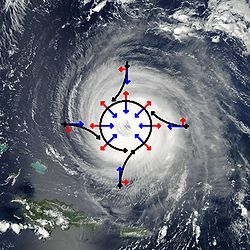 Maps created from this equation show regions where tropical storm and hurricane formation is possible, based upon the thermodynamics of the atmosphere at the time of the last model run. This does not take into account vertical wind shear. A minimum distance of 500 km (310 mi) from the equator (about 4.5 degrees from the equator) is normally needed for tropical cyclogenesis. The Coriolis force imparts rotation on the flow and arises as winds begin to flow in toward the lower pressure created by the pre-existing disturbance. In areas with a very small or non-existent Coriolis force (e.g. near the Equator), the only significant atmospheric forces in play are the pressure gradient force (the pressure difference that causes winds to blow from high to low pressure) and a smaller friction force; these two alone would not cause the large-scale rotation required for tropical cyclogenesis. The existence of a significant Coriolis force allows the developing vortex to achieve gradient wind balance. This is a balance condition found in mature tropical cyclones that allows latent heat to concentrate near the storm core; this results in the maintenance or intensification of the vortex if other development factors are neutral. Whether it be a depression in the intertropical covergence zone (ITCZ), a tropical wave, a broad surface front, or an outflow boundary, a low level feature with sufficient vorticity and convergence is required to begin tropical cyclogenesis. Even with perfect upper level conditions and the required atmospheric instability, the lack of a surface focus will prevent the development of organized convection and a surface low. Tropical cyclones can form when smaller circulations within the Intertropical Convergence Zone merge. Vertical wind shear of less than 10 m/s (20 kt, 22 mph) between the surface and the tropopause is favored for tropical cyclone development. A weaker vertical shear makes the storm grow faster vertically into the air, which helps the storm develop and become stronger. If the vertical shear is too strong, the storm cannot rise to its full potential and its energy becomes spread out over too large of an area for the storm to strengthen. Strong wind shear can "blow" the tropical cyclone apart, as it displaces the mid-level warm core from the surface circulation and dries out the mid-levels of the troposphere, halting development. In smaller systems, the development of a significant mesoscale convective complex in a sheared environment can send out a large enough outflow boundary to destroy the surface cyclone. Moderate wind shear can lead to the initial development of the convective complex and surface low similar to the mid-latitudes, but it must relax to allow tropical cyclogenesis to continue. Limited vertical wind shear can be positive for tropical cyclone formation. When an upper-level trough or upper-level low is roughly the same scale as the tropical disturbance, the system can be steered by the upper level system into an area with better diffluence aloft, which can cause further development. Weaker upper cyclones are better candidates for a favorable interaction. There is evidence that weakly sheared tropical cyclones initially develop more rapidly than non-sheared tropical cyclones, although this comes at the cost of a peak in intensity with much weaker wind speeds and higher minimum pressure. This process is also known as baroclinic initiation of a tropical cyclone. Trailing upper cyclones and upper troughs can cause additional outflow channels and aid in the intensification process. Developing tropical disturbances can help create or deepen upper troughs or upper lows in their wake due to the outflow jet emanating from the developing tropical disturbance/cyclone. There are cases where large, mid-latitude troughs can help with tropical cyclogenesis when an upper-level jet stream passes to the northwest of the developing system, which will aid divergence aloft and inflow at the surface, spinning up the cyclone. This type of interaction is more often associated with disturbances already in the process of recurvature. Worldwide, tropical cyclone activity peaks in late summer when water temperatures are warmest. Each basin, however, has its own seasonal patterns. On a worldwide scale, May is the least active month, while September is the most active. In the North Atlantic, a distinct hurricane season occurs from June 1 through November 30, sharply peaking from late August through October. The statistical peak of the North Atlantic hurricane season is September 10. The Northeast Pacific has a broader period of activity, but in a similar time frame to the Atlantic. The Northwest Pacific sees tropical cyclones year-round, with a minimum in February and a peak in early September. In the North Indian basin, storms are most common from April to December, with peaks in May and November. In the Southern Hemisphere, tropical cyclone activity generally begins in early November and generally ends on April 30. Southern Hemisphere activity peaks in mid-February to early March. Virtually all the Southern Hemisphere activity is seen from the southern African coast eastward, toward South America. Tropical cyclones are rare events across the south Atlantic Ocean and the far southeastern Pacific Ocean. Hurricane Chris formed in the temperate subtropics during the 2012 Atlantic season. Areas farther than 30 degrees from the equator (except in the vicinity of a warm current) are not normally conducive to tropical cyclone formation or strengthening, and areas more than 40 degrees from the equator are often very hostile to such development. The primary limiting factor is water temperatures, although higher shear at increasing latitudes is also a factor. These areas are sometimes frequented by cyclones moving poleward from tropical latitudes. On rare occasions, such as Alex in 2004, Alberto in 1988, and the 1975 Pacific Northwest hurricane, storms may form or strengthen in this region. Typically, tropical cyclones will undergo extratropical transition after recurving polewards, and typically become fully extratropical after reaching 45–50˚ of latitude. The majority of extratropical cyclones tend to restrengthen after completing the transition period. Areas within approximately ten degrees latitude of the equator do not experience a significant Coriolis Force, a vital ingredient in tropical cyclone formation. However, a few tropical cyclones have been observed forming within five degrees of the equator. A combination of wind shear and a lack of tropical disturbances from the Intertropical Convergence Zone (ITCZ) makes it very difficult for the South Atlantic to support tropical activity. Over four tropical cyclones have been observed here such as— a weak tropical storm in 1991 off the coast of Africa near Angola, Hurricane Catarina, which made landfall in Brazil in 2004 at Category 2 strength, and a smaller storm in January 2004, east of Salvador, Brazil. The January storm is thought to have reached tropical storm intensity based on scatterometer wind measurements. Storms that appear similar to tropical cyclones in structure sometimes occur in the Merranean basin. Examples of these "Merranean tropical cyclones" formed in September 1947, September 1969, September 1973, August 1976, January 1982, September 1983, December 1984, December 1985, October 1994, January 1995, October 1996, September 1997, December 2005, September 2006, November 2011, November 2014, November 2017 and September 2018. However, there is debate on whether these storms were tropical in nature. The Black Sea has, on occasion, produced or fueled storms that begin cyclonic rotation, and that appear to be similar to tropical-like cyclones observed in the Merranean. Tropical cyclogenesis is extremely rare in the far southeastern Pacific Ocean, due to the cold sea-surface temperatures generated by the Humboldt Current, and also due to unfavorable wind shear; as such, there are no records of a tropical cyclone impacting western South America. But in mid-2015, a rare subtropical cyclone was identified in early May relatively close to Chile. This system was unofficially dubbed Katie by researchers. Another subtropical cyclone was identified at 77.8 degrees longitude in May 2018, just off the coast of Chile. Vortices have been reported off the coast of Morocco in the past. However, it is debatable if they are truly tropical in character. Tropical activity is also extremely rare in the Great Lakes. However, a storm system that appeared similar to a subtropical or tropical cyclone formed in 1996 on Lake Huron. The system developed an eye-like structure in its center, and it may have briefly been a subtropical or tropical cyclone. El Niño (ENSO) shifts the region (warmer water, up and down welling at different locations, due to winds) in the Pacific and Atlantic where more storms form, resulting in nearly constant Accumulated Cyclone Energy (ACE) values in any one basin. The El Niño event typically decreases hurricane formation in the Atlantic, and far western Pacific and Australian regions, but instead increases the odds in the central North and South Pacific and particular in the western North Pacific typhoon region. Tropical cyclones in the northeastern Pacific and north Atlantic basins are both generated in large part by tropical waves from the same wave train. In the Northwestern Pacific, El Niño shifts the formation of tropical cyclones eastward. During El Niño episodes, tropical cyclones tend to form in the eastern part of the basin, between 150°E and the International Date Line (IDL). Coupled with an increase in activity in the North-Central Pacific (IDL to 140°W) and the South-Central Pacific (east of 160°E), there is a net increase in tropical cyclone development near the International Date Line on both sides of the equator. While there is no linear relationship between the strength of an El Niño and tropical cyclone formation in the Northwestern Pacific, typhoons forming during El Niño years tend to have a longer duration and higher intensities. Tropical cyclogenesis in the Northwestern Pacific is suppressed west of 150°E in the year following an El Niño event. 5-day running mean of MJO. Note how it moves eastward with time. In general, westerly wind increases associated with the Madden–Julian oscillation lead to increased tropical cyclogenesis in all basins. As the oscillation propagates from west to east, it leads to an eastward march in tropical cyclogenesis with time during that hemisphere's summer season. There is an inverse relationship between tropical cyclone activity in the western Pacific basin and the north Atlantic basin, however. When one basin is active, the other is normally quiet, and vice versa. The main cause appears to be the phase of the Madden–Julian oscillation, or MJO, which is normally in opposite modes between the two basins at any given time. Research has shown that trapped equatorial Rossby wave packets can increase the likelihood of tropical cyclogenesis in the Pacific Ocean, as they increase the low-level westerly winds within that region, which then leads to greater low-level vorticity. The individual waves can move at approximately 1.8 m/s (4 mph) each, though the group tends to remain stationary. Since 1984, Colorado State University has been issuing seasonal tropical cyclone forecasts for the north Atlantic basin, with results that are better than climatology. The university has found several statistical relationships for this basin that appear to allow long range prediction of the number of tropical cyclones. Since then, numerous others have followed in the university's steps, with some organizations issuing seasonal forecasts for the northwest Pacific and the Australian region. The predictors are related to regional oscillations in the global climate system: the Walker circulation which is related to the El Niño-Southern Oscillation; the North Atlantic oscillation (NAO); the Arctic oscillation (AO); and the Pacific North American pattern (PNA). ^ "Definition for Cyclogenesis". Arctic Climatology and Meteorology. National Snow and Ice Data Center. Archived from the original on August 30, 2006. Retrieved October 20, 2006. ^ Goldenberg, Stan (August 13, 2004). "What is an extra-tropical cyclone?". Frequently Asked Questions: Hurricanes, Typhoons and Tropical Cyclones. Atlantic Oceanographic and Meteorological Laboratory, Hurricane Research Division. Retrieved August 30, 2008. ^ a b c d e f g h Landsea, Chris. "How do tropical cyclones form?". Frequently Asked Questions. Atlantic Oceanographic and Meteorological Laboratory, Hurricane Research Division. Retrieved October 9, 2017. ^ Landsea, Christopher. "AOML Climate Variability of Tropical Cyclones paper". Atlantic Oceanographic and Meteorological Laboratory. Retrieved September 23, 2010. ^ "Madden-Julian Oscillation". UAE. Retrieved September 23, 2010. ^ Berg, Robbie. "Tropical cyclone intensity in relation to SST and moisture variability" (PDF). RSMAS (University of Miami. Retrieved September 23, 2010. ^ Chris Landsea (January 4, 2000). "Climate Variability table — Tropical Cyclones". Atlantic Oceanographic and Meteorological Laboratory, National Oceanic and Atmospheric Administration. Retrieved October 19, 2006. ^ Matt Menne (March 15, 2000). "Global Long-term Mean Land and Sea Surface Temperatures". National Climatic Data Center. Archived from the original on December 19, 2002. Retrieved October 19, 2006. ^ Kushnir, Yochanan. "The Climate System". EESC. Retrieved September 24, 2010. ^ John M. Wallace & Peter V. Hobbs (1977). Atmospheric Science: An Introductory Survey. Academic Press, Inc. pp. 76–77. ^ Chris Landsea (2000). "Climate Variability of Tropical Cyclones: Past, Present and Future". Storms. Atlantic Oceanographic and Meteorological Laboratory. pp. 220–41. Retrieved October 19, 2006. ^ Dian J. Gaffen-Seidel, Rebecca J. Ross and James K. Angell (November 2000). "Climatological characteristics of the tropical tropopause as revealed by radiosondes". National Oceanic and Atmospheric Administration Air Resources Laboratory. Archived from the original on May 8, 2006. Retrieved October 19, 2006. ^ Lixion Avila (December 3, 2005). "Hurricane Epsilon Discussion Eighteen". National Hurricane Center. Retrieved December 14, 2010. ^ Kerry A. Emanuel (1998). "Maximum Intensity Estimation". Massachusetts Institute of Technology. Retrieved October 20, 2006. ^ Department of Atmospheric Sciences (October 4, 1999). "Pressure Gradient Force". University of Illinois at Urbana-Champaign. Retrieved October 20, 2006. ^ G.P. King (November 18, 2004). "Vortex Flows and Gradient Wind Balance" (PDF). University of Warwick. Archived from the original (PDF) on November 29, 2007. Retrieved October 20, 2006. ^ Kepert, Jeffrey D. (2010). "Tropical Cyclone Structure and Dynamics" (PDF). In Johnny C.L. Chan, Jeffrey D Kepert (ed.). Global Perspectives on Tropical Cyclones: From Science to Mitigation. Singapore: World Scientific. ISBN 978-981-4293-47-1. Archived from the original (PDF) on June 29, 2011. Retrieved February 2, 2011. ^ Kieu, Chanh Q. & Da-Lin Zhang (June 2010). "Genesis of Tropical Storm Eugene (2005) from Merging Vortices Associated with ITCZ Breakdowns. Part III: Sensitivity to Various Genesis Parameters". Journal of the Atmospheric Sciences. 67 (6): 1745. Bibcode:2010JAtS...67.1745K. doi:10.1175/2010JAS3227.1. ^ "Hurricanes: a tropical cyclone with winds > 64 knots". University of Illinois. 2006. Retrieved March 24, 2014. ^ Department of Atmospheric Sciences (DAS) (1996). "Hurricanes". University of Illinois at Urbana-Champaign. Retrieved August 9, 2008. ^ University of Illinois (October 4, 1999). Hurricanes. Retrieved 2008-08-17. ^ M. E. Nicholls & R. A. Pielke (April 1995). "A Numerical Investigation of the Effect of Vertical Wind Shear on Tropical Cyclone Intensification" (PDF). 21st Conference on Hurricanes and Tropical Meteorology of the American Meteorological Society. Colorado State University. pp. 339–41. Archived from the original (PDF) on September 9, 2006. Retrieved October 20, 2006. ^ Clark Evans (January 5, 2006). "Favorable trough interactions on tropical cyclones". Flhurricane.com. Retrieved October 20, 2006. ^ Deborah Hanley; John Molinari & Daniel Keyser (October 2001). "A Composite Study of the Interactions between Tropical Cyclones and Upper-Tropospheric Troughs". Monthly Weather Review. 129 (10): 2570–84. Bibcode:2001MWRv..129.2570H. doi:10.1175/1520-0493(2001)129<2570:ACSOTI>2.0.CO;2. ISSN 1520-0493. ^ Eric Rappin & Michael C. Morgan. "The Tropical Cyclone — Jet Interaction" (PDF). University of Wisconsin, Madison. Archived from the original (PDF) on September 7, 2006. Retrieved October 20, 2006. ^ a b c d e f Atlantic Oceanographic and Meteorological Laboratory, Hurricane Research Division. "Frequently Asked Questions: When is hurricane season?". National Oceanic and Atmospheric Administration. Archived from the original on May 5, 2009. Retrieved July 25, 2006. ^ Kaye, Ken (September 9, 2010). "Peak of hurricane season". Sun Sentinel. Retrieved September 23, 2010. ^ Chris Landsea (July 13, 2005). "FAQ: Why doesn't the South Atlantic Ocean experience tropical cyclones?". NOAA. Retrieved May 14, 2009. ^ a b c d e Hurricane Research Division. "Frequently Asked Questions: What are the average, most, and least tropical cyclones occurring in each basin?". National Oceanic and Atmospheric Administration's Atlantic Oceanographic and Meteorological Laboratory. Retrieved December 5, 2012. ^ RA I Tropical Cyclone Committee (November 9, 2012). Tropical Cyclone Operational Plan for the South-West Indian Ocean: 2012 (PDF) (Report No. TCP-12). World Meteorological Organization. pp. 11–14. Archived (PDF) from the original on March 29, 2015. Retrieved March 29, 2015. ^ National Climate Prediction Centre (October 14, 2013). "2013/14 Australian Tropical Cyclone season outlook". Australian Bureau of Meteorology. Retrieved October 14, 2013. ^ RSMC Nadi — Tropical Cyclone Centre (October 22, 2015). "2015–16 Tropical Cyclone Season Outlook in the Regional Specialised Meteorological Centre Nadi – Tropical Cyclone Centre (RSMC Nadi – TCC) Area of Responsibility (AOR)". Fiji Meteorological Service. Archived from the original (PDF) on October 22, 2015. Retrieved October 22, 2015. ^ James L. Franklin (October 26, 2004). "Hurricane Alex Tropical Cyclone Report". National Hurricane Center. Retrieved October 24, 2006. ^ "Alberto "Best-track"". Unysis Corporation. Archived from the original on January 31, 2008. Retrieved March 31, 2006. ^ "12" "Best-track". Unysis Corporation. Archived from the original on January 31, 2009. Retrieved March 31, 2006. ^ Evans, Jenni L.; Hart, Robert E. (May 2003). "Objective Indicators of the Life Cycle Evolution of Extratropical Transition for Atlantic Tropical Cyclones". Monthly Weather Review. 131 (5): 911–913. Bibcode:2003MWRv..131..909E. doi:10.1175/1520-0493(2003)131<0909:OIOTLC>2.0.CO;2. ^ Chang, C.-P.; Liu, C.-H.; Kuo, H.-C. (February 2003). "Typhoon Vamei: An equatorial tropical cyclone formation". Geophysical Research Letters. 30 (3): 1150. Bibcode:2003GeoRL..30.1150C. doi:10.1029/2002GL016365. Retrieved November 15, 2010. ^ Staff Writer (October 28, 2010). "Tropical Cyclone Guidance 2010–11" (PDF). Fiji Meteorological Service. Archived from the original (PDF) on November 13, 2010. Retrieved November 13, 2010. ^ Atlantic Oceanographic and Meteorological Laboratory, Hurricane Research Division. "Frequently Asked Questions: Why doesn't the South Atlantic Ocean experience tropical cyclones?". National Oceanic and Atmospheric Administration. Retrieved July 25, 2006. ^ Department of Meteorology, e-Education Institute. "Upper-Level Lows". Meteorology 241: Fundamentals of Tropical Forecasting. Pennsylvania State University. Archived from the original on September 7, 2006. Retrieved October 24, 2006. ^ "Monitoramento – Ciclone tropical na costa gaúcha" (in Portuguese). Brazilian Meteorological Service. March 2010. Archived from the original on March 10, 2010. ^ Atlantic Oceanographic and Meteorological Laboratory, Hurricane Research Division. "Frequently Asked Questions: What regions around the globe have tropical cyclones and who is responsible for forecasting there?". NOAA. Retrieved July 25, 2006. ^ a b "Miscellaneous Images". Met Office. Archived from the original on September 29, 2007. Retrieved November 21, 2015. ^ Diamond, Howard J (August 25, 2015). "Review of the 2014/15 Tropical Cyclone Season in the Southwest Pacific Ocean Basin". Climate Program Office. National Oceanic and Atmospheric Administration. Retrieved October 16, 2017. ^ Jonathan Belles (May 9, 2018). "Extremely Rare Southeast Pacific Subtropical Cyclone Forms Off the Chilean Coast". The Weather Channel. Retrieved May 10, 2018. ^ Todd Miner; Peter J. Sousounis; James Wallman & Greg Mann (February 2000). "Hurricane Huron". Bulletin of the American Meteorological Society. 81 (2): 223–36. Bibcode:2000BAMS...81..223M. doi:10.1175/1520-0477(2000)081<0223:HH>2.3.CO;2. ^ "Climate Change 2007: Working Group I: The Physical Science Basis". IPCC. 2007. ^ Avila, Lixion A.; Pasch, Richard J. (March 1995). "Atlantic Tropical Systems of 1993". Monthly Weather Review. 123 (3): pg. 893. Bibcode:1995MWRv..123..887A. doi:10.1175/1520-0493(1995)123<0887:ATSO>2.0.CO;2. ISSN 1520-0493. ^ a b Chan, J. C. L. (April 1985). "Tropical Cyclone Activity in the Northwest Pacific in Relation to the El Niño/Southern Oscillation Phenomenon". Monthly Weather Review. 113 (4): 599–606. Bibcode:1985MWRv..113..599C. doi:10.1175/1520-0493(1985)113<0599:TCAITN>2.0.CO;2. ISSN 1520-0493. ^ Bureau of Meteorology Research Centre. "ENSO Relationships with Seasonal Tropical Cyclone Activity". Global Guide to Tropical Cyclone Forecasting. Australian Bureau of Meteorology. Archived from the original on November 27, 2012. Retrieved October 20, 2006. ^ Camargo, Suzana J.; Adam H. Sobel (August 2005). "Western North Pacific Tropical Cyclone Intensity and ENSO". Journal of Climate. 18 (15): 2996. Bibcode:2005JCli...18.2996C. doi:10.1175/JCLI3457.1. ^ John Molinari & David Vollaro (September 2000). "Planetary- and Synoptic-Scale Influences on Eastern Pacific Tropical Cyclogenesis". Monthly Weather Review. 128 (9): 3296–307. Bibcode:2000MWRv..128.3296M. doi:10.1175/1520-0493(2000)128<3296:PASSIO>2.0.CO;2. ISSN 1520-0493. ^ Maloney, E. D. & D. L. Hartmann (September 2001). "The Madden–Julian Oscillation, Barotropic Dynamics, and North Pacific Tropical Cyclone Formation. Part I: Observations". Journal of the Atmospheric Sciences. 58 (17): 2545–2558. Bibcode:2001JAtS...58.2545M. CiteSeerX 10.1.1.583.3789. doi:10.1175/1520-0469(2001)058<2545:TMJOBD>2.0.CO;2. ISSN 1520-0469. ^ Kelly Lombardo. 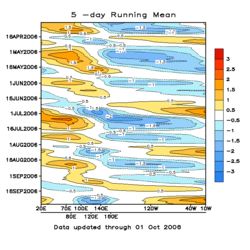 "Influence of Equatorial Rossby Waves on Tropical Cyclogenesis in the Western Pacific" (PDF). State University of New York at Albany. Retrieved October 20, 2006. ^ a b Philip J. Klotzbach; Willam Gray & Bill Thornson (October 3, 2006). "Extended Range Forecast of Atlantic Seasonal Hurricane Activity and U.S. Landfall Strike Probability for 2006". Colorado State University. Retrieved October 20, 2006. ^ Mark Saunders & Peter Yuen. "Tropical Storm Risk Group Seasonal Predictions". Tropical Storm Risk. Archived from the original on May 4, 2006. Retrieved October 20, 2006.